Congratulation to the 4 of you! How fabulous! 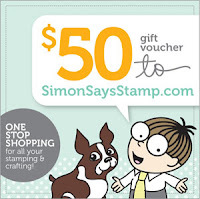 Many thanks, Simon Says Stamp & Show! Oh thank you so much! I am honored and thrilled to be in the company of so many wonderful artists! Congrats to all the winner!!!! Congrats to all the winners! Such gorgeous projects. Enjoy the shopping Marjie!